Mix the sugars, cinnamon in a bowl.Stir in the vanilla. Add the sugar mixture to your apples and toss, making sure all the apple slices are covered. 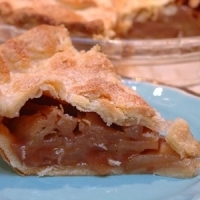 Fill a prepared crust with apple mixture cover with second crust, make a few slits in the crust to allow for steam to escape and bake at 400F for an hour. The pie is done when the apples are tender when a tester is inserted. Let cool completely and better overnight so all the juices meld together. I'm so glad you all like it and agree...It was so much fun this weekend to have a little apple pie competition! I do something very similar-it's good! The hardest thing about making these is peeling & slicing the apples...well worth the effort tho'! High 5 on my list!